(probably in his 60s) has gone through in life. children and are grateful for the opportunity. helping others One at a time...or more. pursue a career of her choice -- catering. Nancy Jemima Atuluku is an artist, writer, missionary and founder/ coordinator of Return to Life Missions (RTL), which is based in Nigeria. Most of her work is done in Africa and her recent Skills-Transfer Project was designed to encourage resourcefulness, creativity and entrepreneurship development as a means of combatting the problem of unemployment and ultimately alleviating poverty. 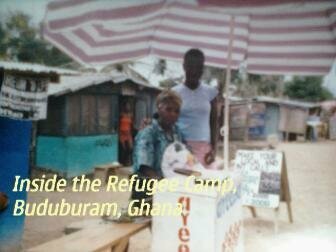 One of RTL’s major Skills-Transfer Projects was executed at the Liberian Refugee Camp, Buduburam in the Gomoa District, Central Region, Ghana, between 2003 and 2008. There, beneficiaries, who had mostly been traumatized by armed conflict, received training on entrepreneurship development and acquired skills in fine art and textile design, which included drawing, painting, crafting and the production of batik and tie-dye materials for various uses. Subsequently, they were encouraged to return home to post-war Liberia to rebuild their lives and country rather than go to the USA, Canada, Australia and other such countries on the United Nations High Commissioner for Refugees resettlement program. Before returning to Liberia, some of the trainees started small-scale businesses right there on the camp! Many have returned home to Liberia and own small-scale businesses there.